Connects: Yellowhead Hwy. to Alaska Hwy. The Cassiar Highway junctions with Yellowhead Highway 16 at Milepost PG 298, Skeena River bridge, and travels north to junction with the Alaska Highway at Milepost DC 626.2, 13.3 miles/21.4 km west of Watson Lake, YT. 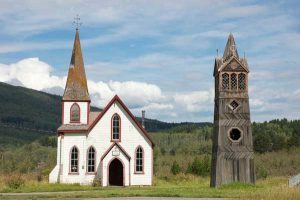 The Cassiar Highway offers outstanding scenery and good wildlife viewing, especially of black bears in the spring. 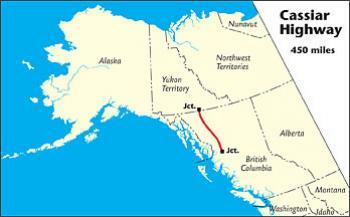 Driving the Cassiar Highway instead of the entire Alaska Highway saves about 130 miles/210 km. 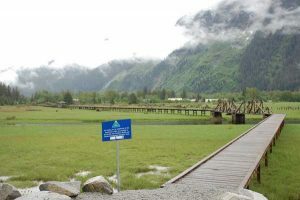 The Cassiar provides access to Hyder, AK, and Stewart, BC, via the 40-mile/64-km Stewart-Hyder access road (Highway 37A) from Meziadin Junction at Milepost J 97. 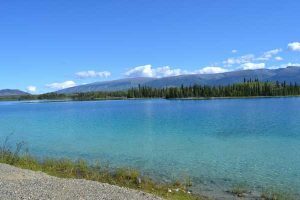 The Cassiar also provides access to Telegraph Creek via a 70-mile/113-km side road from Dease Lake junction at Milepost J 303.9. 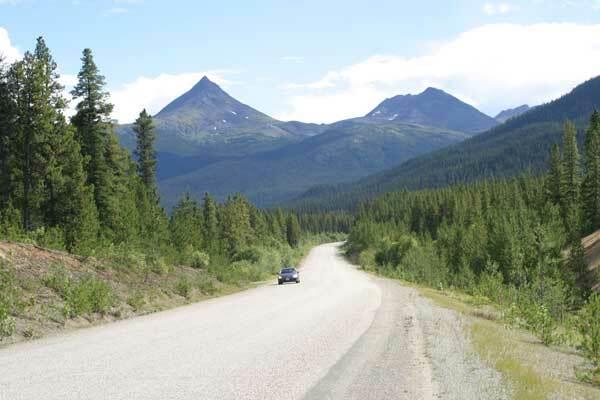 The Cassiar Highway was completed in 1972, and is asphalt-surfaced with the exception of a few short gravel breaks. The highway is generally narrower than most 2-lane highways, with little or no shoulder. It has easy curves and some long straight stretches. Although not particularly hilly, there are a few 8 percent grades and 2 switchback turns. There are no passing lanes, beyond one in the first few miles of the highway, The centerline and edge line markings may be missing along some northern sections of the highway. Drive with your headlights on at all times. Also watch for logging and freight trucks on the highway. Miles from Yellowhead Highway junction (J) shown.J 0 Junction with the Yellowhead Highway; gas station. J 0.2 Turnoff for Gitwangak; totem poles, St Paul’s Anglican Church and bell tower (1893); pictured at right. 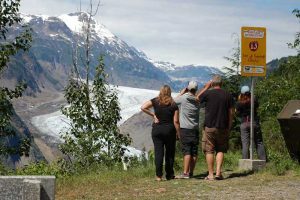 J 2.5 Cassiar RV Park to west; full-service sites, May to September. J 2.7 Access road to KITWANGA (pop. 481) with access to Gitwangak Battle Hill National Historic Site. J 13.1 Access to GITANYOW (pop. 434); gas/diesel bar. Attraction: One of the largest concentrations of standing totem poles in northwestern British Columbia. J 88.8 Nass River Bridge. J 96.5 Meziadin Lake Provincial Park; camping. J 97.5 Meziadin Junction has gas, lodging, cafe and convenience store. Junction with BC Highway 37A which leads 38 miles, past Bear Glacier, to downtown STEWART, BC (pop. 699). Groceries, gas/diesel/propane, churches, visitor centre, dining and lodging available in Stewart. Hotel accommodations at the Ripley Creek Inn. Full-service camping as you enter Stewart at Bear River RV Park (turn at Mile 36.9 on Highway 37A, just west of Bear River Bridge #1). Attractions in Stewart include historic buildings, fishing, the museum, and an estuary boardwalk (pictured at left). Road continues across international border (you must stop at customs) to HYDER, AK (pop. 100); camping, general store. Head out Salmon River Road (paved) for Fish Creek Wildlife Observation Area for bear viewing; continue up gravel Salmon Glacier Road for views of Salmon Glacier (pictured at right). J 117.3 Bell I Crossing: Bell-Irving River Bridge #2. J 153.6 Mehan Lake Provincial Rest Area. J 155 Bell 2 Lodge; food, gas, lodging, tent and RV camping. J 155.2 Bell II Crossing across Bell-Irving River. J 162.9 Red Flats Rest area. J 171.2 Ningunsaw Summit (elev. 1,530 feet/466m). J 184 Bob Quinn Rest Area. J 207 Burrage River bridge. J 209.8 Burrage Hill; southbound brake-check area to west with litter bin. J 215 Eastman Creek Rest Area. J 227.1 Kinaskan Provincial Park; camping. J 242.7 Tatogga Lake Resort; food, gas/diesel, camping, lodging (open May to October). J 246.8 Rest Area beside Eddontenajon Lake. J 252.5 ISKUT (pop. 283); grocery, gas, diesel, restaurant. J 254.1 Mountain Shadow RV Park & Campground,, downhill to west; cabins available. Fishing, birding, and wildlife viewing. J 272.1 Stikine River Bridge (1-lane, metal deck). J 298.1 Dease Lake Lions Tanzilla River Campground; 15 natural wooded RV sites plus tent sites; picnic tablels, firepits. J 303.3 Campground in town. J 303.8 Lodging at Northway Motor Inn and Arctic Divide Inn and Motel. J 303.9 DEASE LAKE (pop. 450); Petro Canada station with gas/diesel and Super A grocery at junction with Telegraph Creek Road. 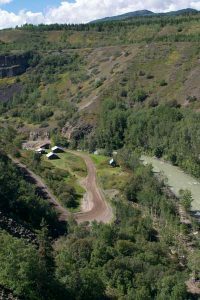 This 71-mile side road (pictured at right) is a winding, gravel road with some steep sections, which leads west to historic TELEGRAPH CREEK on the Stikine River; limited services. J 310 Water’s Edge Campground to west on Dease Lake (phone 250-771-3392); RV sites, cabin rentals. J 322 Rabid Grizzly Rest Area. J 374.9 “Jade City” consists of a jade store with jade cutting demonstrations, gift shop, and 5-room hotel. J 389.5 GOOD HOPE LAKE (pop. 75); store with above-ground gas tank (not a reliable source for gas). J 397.2 Boya Lake Provincial Park campground, 1.2 miles east of highway; beautiful lake (pictured to left). J 450.1 Junction with Alaska Highway; gas station with gas/diesel/propane, convenience store. Watson Lake is 13.3 miles southeast. Nugget City (gas, accommodations, restaurant, gift shop, campground) is less than a mile west on the Alaska Highway.